Nevada DUI School: Registration for this course is quite simple. You can click on the webpage above and be taken to the online registration page. Just complete all the appropriate fields and you can get started right away! 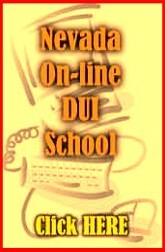 The course is designed as an alternative to a classroom DUI program, and is approved by the Nevada DMV (DUI000025947). The course is designed for an individual who does not have a lot of time. The course is broken up into sections and you can log off and then log back on at a later time. The computer will record the section you have completed. You can also do the entire course in one sitting.....it is up to you. Once you have finished the program, you are asked to complete an evaluation of the course and we will forward the original completion certificate to the court or the agency requiring course attendance for you. The course cost includes the entire program and the certificate.